This makes an attractive dessert that is ideal when you have guests, or as a family treat. It can be prepared in advance and assembled easily at the last minute. Preheat the oven to 200°C, gas mark 6. Halve and stone the peaches and plums and arrange, cut sides up, in a shallow dish large enough to hold them all in one layer. Do not worry if you have to squash them up a bit. Put the star anise in a small pan with the cinnamon stick, orange zest and juice, and sugar. Gently bring to the boil, stirring until the sugar has dissolved. Simmer for 2 minutes, then pour evenly over the fruit. Roast uncovered for 25-30 minutes, basting halfway though the cooking time, until the fruit is tender. Cool for 10 minutes then divide between serving plates. 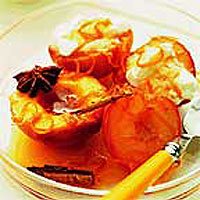 Place a dessertspoonful of yogurt into the cavity of each fruit and drizzle some of the sauce over. Serve the rest of the yogurt separately. You can make this dessert a few hours in advance to the end of step 2. Allow to cool and keep in the fridge until needed. Reheat in the microwave on medium for 6-8 minutes, or cover the dish with foil and heat through in the oven at 180°C, gas mark 4 for 15 minutes. Continue with step 3 to serve. Use a flavoured yogurt as an alternative to plain yogurt. If you prefer, this recipe can be made with either just peaches or just plums. Later in the year, nectarines can be used, when available.